Cowley College’s main campus in Arkansas City played host to the Cowley C.A.R.E conference Sunday, August 15 in the Earle N. Wright Community Room. Sixty three people attended the event. The day consisted of professional presenters from all over the state of Kansas, four concurrent sessions, lunch, vendors, and lots of smiling Child Care Providers. The event started with registration from 7:30-8 a.m. and then went right into a concurrent session from 8-8:45 a.m. featuring keynote speaker Carolyn Dunn, professor and head of the Department Youth, Family, and Community Sciences at North Carolina State University. Dunn attended the event through a grant that the K-State Extension office received through the health eating coalition. Dunn shared her expertise for nutrition and wellness for families and communities. She has 20+ years of experience in nutrition education and develops nutrition education materials that are used across the country. Dunn is the author/developer for numerous programs and tools that address healthy eating and physical activity. She is the lead author of the award winning Color Me Healthy, a curriculum that helps young children eat smart and move more. During concurrent session two, from 8:45-10:15 a.m., the participants were offered the options of: “Literature and Puppet Fun” by Cheryl Firsching from Child Start of Wichita, KS, or “Active Learning and Parent Engagement” by Regina Miller, director of Princeton Child Care in Wichita. Concurrent session three, started at 10:45 a.m. and ended at 12:15 p.m. with the options of attending either a session on, “More Science in Your Day” by Julie Rhoads, Director of Education at Cowley College, or “Color Me Healthy”. Rhoads collected totes with science equipment from Kansas Strong for her presentation, so everyone that attended received a take home science kit. During lunch, the participants had time to eat and the option of browsing the 11 different vendor booths available. The event was catered by Steamy Joe's Coffee Shop. “Ruth Ryel, co-owner of Steamy Joe's Coffee Shop, and her crew walked in, set up, fed us an amazing spread, including a sample of their wonderful cupcakes, cleaned up and left us all full and happy,” Davidson said. The day ended with Concurrent session four, which included the option of a repeat of the morning session “Literature and Puppet Fun” or “More Science in Your Day”. This year’s participants were happy to hear Davidson is already involved in the planning phase for next year’s event. 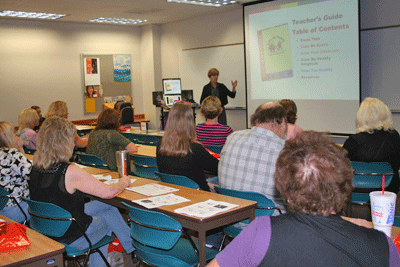 Pictured: Carolyn Dunn speaks to individuals at the Cowley C.A.R.E. conference.